From Texas to the Vatican, Satan Lives meets with Satanists, exorcists, cult icons - believers and non-believers alike - to ask why in the age of reason the Devil remains so powerful and seductive. About Varg Vikernes and the church burnings in Bergen, Norway 1993. And all the media circus around it. Documentary follows Bobby Liebling, lead singer of seminal hard rock/heavy metal band Pentagram, as he battles decades of hard drug addiction and personal demons to try and get his life back. 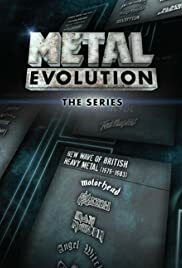 Metal Evolution is broken down into episodes about a different piece of metal history. The series includes interviews with and about Alice Cooper, Slash, Lemmy, Rob Zombie, members of Megadeth, Metallica, Iron Maiden, Black Sabbath, Deep Purple, Slayer, Judas Priest, Van Halen, Whitesnake, Def Leppard, The Stooges, ZZ Top, Soundgarden, Mötley Crüe, Poison, Rage Against the Machine, Alice in Chains, Korn, Slipknot, Lamb of God and more. This is just a general overview of the entire series. The 1000-word limit makes it near-impossible for me to cover all 11 episodes in a satisfactory manner. So, if you have nothing better to do, look up my reviews on the individual episodes to get a more detailed appraisal of Dunn's ambitious little project. Sam Dunn. The best thing about him is his short name; it doesn't take a long time to write. I have issues though with the way he presents the development of metal and its branches. A typical Sociology Major, Dunn thinks that human environment is at the root of EVERY change, whether in music or generally. Hence this naive/deluded need to over-focus on "teen angst" and "alienated youth rebellion". Well, "angry teens" had existed 50 years ago, too, 5000 years ago; they were always around. Metal developed only recently mainly due to technology: it's that simple. But Sociologists are notorious for talking about the bleedin'-obvious - as well as missing the bloody obvious. The episodes are too short. 45 minutes isn't enough to cover any of these branches – not even the awful ones such as nu-metal and power metal. However, that probably wasn't Dunn's fault; I assume it's the time-framework within which he had to work. He is to blame though for wasting some of that precious limited screen-time by inserting interviews with quasi-experts/outsiders who have either nothing interesting to say or who can't even get basic facts straight. For example, interviewing a Marxist college-professor who actually argued that Metallica sold out on the "black album" because they recorded ballads for it. Never did it occur to her to actually PLAY their albums; that way she would've learned that Metallica had recorded ballads on three previous albums. In the same episode, an author of a book ironically titled "Extreme Metal" tells us in all seriousness that "death metal completely abandoned all melodies". So how does that help in making me believe that he is a go-to person for extreme metal? Farcical. Dunn's over-zealousness to lend the series "credibility"/seriousness – by interviewing pseudo-intellectuals (i.e. those who conned him into believing they were part of the "all-knowing", highly analytical intelligentsia) who know next-to-nothing about metal but act as if they have all the answers – is annoying. Contrary to popular opinion, there actually are intelligent, knowledgeable, and fascinating characters in the metal scene itself: there is NEVER need for metal documentary-makers to go for "outside help" in explaining the genre. 1: most metal fans don't want to listen to these attention-seeking "experts" with their long-winded, far-fetched and nebulous theories on metal's "social relevance". 2: the uninitiated will be mislead by listening to so-called "experts" who prefer to let their imaginations run wild, making up nonsense about the meaning/origins of metal, as opposed to looking at the genre in a realistic, down-to-Earth manner. Besides, I'd rather hear about it from the horse's mouth than listen to the views of people who obtained most of their limited knowledge second-hand or even third-hand. The most irritating aspect of the series is metal's oft-touted "socio-political relevance". There are even some fools who claim that metal was created by youths reacting against the status quo, the so-called "Establishment" (i.e. the same society that enabled their freedom to explore music in such an adventurous manner in the first place) – and we all know what is really meant by this: kids from the "proletariat" rejecting the vicious, "decadent" Capitalism that oppressed them so; a romantic notion, but far-removed from the truth. Besides, it is mind-bogglingly hypocritical that these Western Communists actually suggest that metal kids look toward Marxism as some sort of "bastion of hope and freedom"; in those countries metal-heads usually had a hard time even finding/buying metal albums, let alone being able to pursue careers with their own bands. Socialism as the "Great Youth Liberator"? You've got to be kidding me. The emergence of metal and its subsequent and speedy evolution had mainly to do with the huge/rapid leaps in music equipment. Or would anyone suggest that metal could have just as easily started in the early 1900s? Before Christ? The reason why it became increasingly heavier, with thrash starting off a long chain of extreme sub-genres, is the technology: continually improving guitars/amps/pedals. Without an improvement in the gear since the early 70s there would have been most likely no thrash, and certainly no industrial or death metal, both of which heavily rely on high-quality productions/sounds to avoid sounding like unlistenable noise. (Pop fans might beg to differ.) Especially thrash had little to do with "alienation" or any such baloney which left-wing rock analysts want to believe in so very much because that would back up their own misogynist worldview. Metal bands – those few that are overtly political - may generally tend to lean toward left-wing politics (as nearly all forms of rock), but there are too many non-liberal – key – figures in metal for Marxists to be able to claim metal as the natural extension of their decadent ideology, or to be able to misuse metal as an extended arm of their powerful world-wide media propaganda. Alice Cooper, Lemmy, Hetfield, Nugent, Peart, Simmons, Kerry King, Pete Steele, Mustaine: just some of the big names that are well-known for not being liberals. I am disappointed at how Dunn managed to omit some key bands in certain episodes. His coverage of thrash was quite solid (you can't make a bad episode about it if you tried), but even there he blundered by omitting Venom, Voivod (wearing their T-shirt doesn't cut it), the German trio, SYL, Machine Head and Grip Inc, while actually wasting the viewer's time with later mediocre garbage such as In Flames, At the Gates, etc. Given its flaws, such as the superficiality that stems from overly compressed/crammed info, the series is of more use to those clueless about metal than to fans. 11 of 37 people found this review helpful. Was this review helpful to you?